Arura is the Tibetan name for a fruit growing on a wild tree belonging to the Terminalia plant family. This is an extensive botanical group of trees that is specially adapted to the different variations of subtropical Asian mountain climate. The particular Terminalia tree which generates the Arura fruit used to populate above all the south-east hot, dry zones of the Asian mountain slopes preferably between 500 and 1000 meters. The fruit is a drupe remotely resembling olives. It has a yellowish-green color when ripe. The taste of the fruit is strange and unique. It is said to have all six kind of taste. After our preserving by a natural method it most resembles the taste of European olives. The old scriptures of the Indian naturopathy, the Ayurveda as well as the Tibetan system of natural medicine mention seven to eight different kind of Arura, which differ in shape, color, size and structure of skin. In both traditions, this fruit is regarded as something very special. Its mythological origin is the heaven of gods. Indra, the king of gods, was trying to safe Amrita, the nectar of long life from being stolen by the demons. By this intervention the nectar unintentionally fell to earth, mutated and became the Aruratree. Shakyamuni, the Buddha of our present era, revealed the principles of the highest medicine, which until today is known as the Eightfold Essence Teaching. Gautama Buddha sat down for meditation and transformed into the shape of a healer with an energetically radiant blue color while giving instructions about all aspects of human health-care and medicine. In this specific form of radiance the "king of healing" holds a fruit-carrying twig of the Arura-tree in his right hand. This special form of the Buddha's mystical manifestation is called Vaidurya in Sanskrit or in Tibetan Sangye Menla. 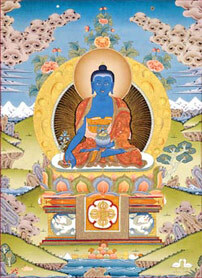 In the east of his Mandala (a visual cosmogram) in which this blue "Medicine Buddha" resides, the "fragrant mountain", Ponadan can be found. This is a forest of different myrobalan trees, whose fragrance can be smelled from a distance and which expels all "404 diseases" (- known in the Tibetan naturopathy). "Myrobalan contains all the tastes...This fruit is hot, soothing, has a calming effect, is light, stimulates the digestive fire as well as digestion itself and prolongs life. It invigorates and protects, is the best of all tonics, is good for the intelligence and strengthens the senses." In contrast to "normal" fruit, myrobalan contains almost all of the highly nutritive essential amino acids! Its vitamin content has been compared to that of apples with the result that Arura: "contains about 10 to 20 times more vitamins and valuable trace elements!" The research culminates in the finding, that: "myrobalan is highly nutritive and should be guarded to not disappear due to deforestation" The dietary importance of the fruit cannot be overestimated!" Only today it will be very difficult to find such kind of myrobalan forests left in the mountain regions of Asia. In the early industrial times this fruit was used in large amounts by the factories for tanning leather or making coloring agents and writing ink. After 1920, the progress in chemistry sentenced the fruit to industrial uselessness. This is why this tree lost its economic importance as a living being and, as a result, was sent to the sawmills. Today its stock is reduced to such an extent that it is a problem to find a cohesive unit, hills full of fragrant Arura trees. The Arura-tree depends very much on the help of a special mammal, the barking deer, to spread its seeds around. But this animal is today more easy to find in gourmet restaurant menu cards than inside Asian forests. After the destructive lumbering the tree is now depending very much on human intervention to survive in its natural habitat. Ponadan Project is engaged in protecting the last wild original stands of Myrobalan-trees and reforesting these sensitive species in their natural Asian habitats. Please enter a quantity pcs. Himalayan Olives collected in the wild are not pasteurised or treated with any chemicals. With one kilo of fruit you will have enough vital enzymes and vitamins for around two months! Please enter a quantity in kilogram from the block price list kg. There are three different main myrobalan-fruits, which constitute the most basic substance of the Indian and the Tibetan health doctrine. Please enter a quantity in gram from the block price list gr. Freshly pickled Arura fruits are still available !!! The new harvest has passed customs...and arrived at destination. Due to new "European" antidiscrimation laws delivery is only possible with prior payment! Please use our bank data below...or wait for our paypal bill. If you really like to get a complete new approach to an easy acquirebal and stabile health even without these fruits, please order my book in English language : 18.- EUR including postage.